Introducing the Venture series, zero-turn machines with the most capacity and features in our lineup. They are excellent for larger residential and commercial properties. 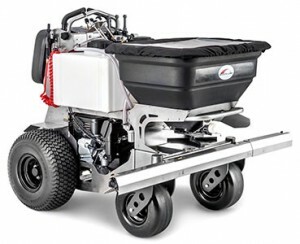 They feature either a 120# or 220# hopper, 24 gallon spray capacity (dual tanks), a variable spinner platter, adjustable maximum ground speed, constant bypass agitation, a foot and hand pump switch as well as a suspension foot plate. Our machines are an excellent choice for your business because they are constructed entirely of stainless steel thus eliminating corrosion and rust. They will stand up to your toughest spreading and spraying demands.